Catalog Page 45. 4" toy dog key chains. 4" elephant keychains. Lion keychains. Catalog Page 45 features more of our 4" Keychain Pals. 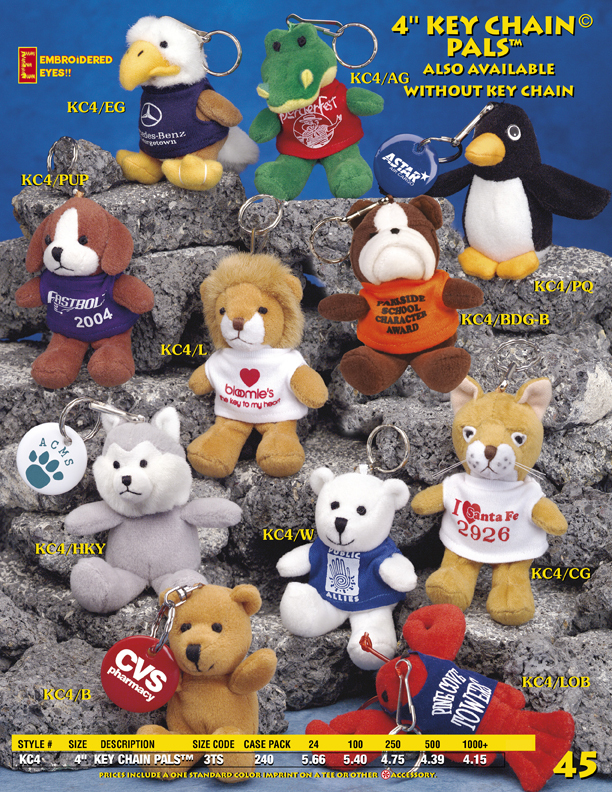 These 4" stuffed animal keychain stuffed toys are popular for corporate promotions and hospitals. You can mix and match animal styles without charge. This collection includes the moose, elephant, tiger, pig, wolf, cow, bear, monkey, bulldog and frog. Each keychain animal wears a custom printed shirt featuring your logo or slogan. The above pricing includes the shirt with a one-color imprint. Order custom key chain animals from our teddy bear company. The lead-time for production is 10 - 14 days.